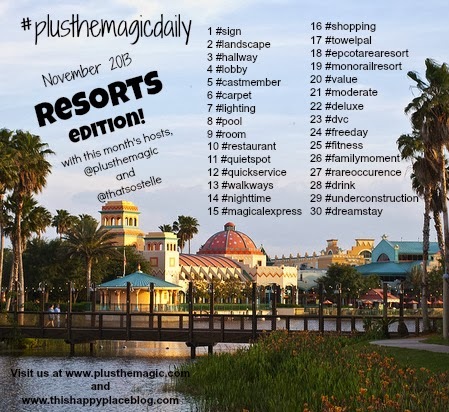 I had so much fun hosting the first #PlusTheMagicDaily Instagram photo challenge with This Happy Place Blog last month! We had great participation for our first time, and everyone shared fantastic pictures all month long. We decided to keep it rolling and do one for November! Unfamiliar with Instagram photo challenges? It's easy to participate! Just post a photo on Instagram, and include #plusthemagicdaily in your caption or comment. Use the prompt for each day of the month to inspire your ideas on which photos to choose. For example- On November 1, I posted this photo, and captioned it with #plusthemagicdaily and #sign (as well as a few other relevant hashtags). Sounds great! I'm in. It was super fun following this in October. BTW- love the photo, above, used as the background for the list. Where in The World was that taken? It looks so fun! That's Coronado Springs resort- my favorite moderate!